Under Armour tactical apparel keeps you cool when things get hot. Armourblock® technology neutralizes the microbes that cause odor before there's any odor at all. The result: moisture transport with maximum scent suppression. For when it's hot. Keeping athletes cool, dry, and light. Ideal use: Extremely warm weather. Over a decade ago, HeatGear®, the original second skin layer, sparked the revolution of performance apparel and rendered cotton T-shirts obsolete. Warning! This product is not flame-retardant. 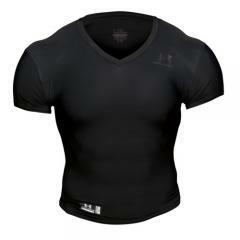 The benefits of the Under Armour HeatGear® Full T in a versatile v-neck. Designed for reliable moisture transport and comfort under your uniform or Vest. Under Armor ArmourBlock® technology eliminates odor causing microbes. Much cooler. I still sweat in this but don't arrive home soaked under my vest.